One of the features that everyone is waiting for for Teams is Federation. That is the ability to communicate with people outside your organisation. When I say communicate, I mean presence first and foremost, chat (instant messaging), audio/video calling and sharing. I know you can already do this if you set up a meeting with someone outside, but this isn’t federation. This works because you invited external people with an email address (MPN) to your meeting. 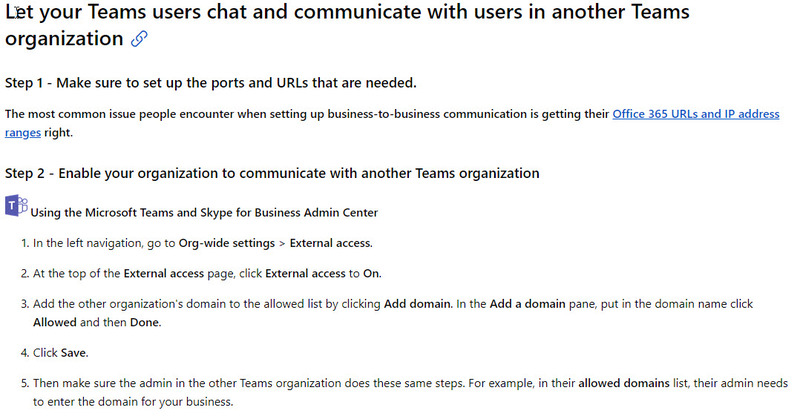 Presence in Skype for Business of a Teams user. If you tag a user for status change you’ll see immediately when the user signs into Teams or becomes available. Sadly, presence information isn’t exchanged between two Teams users. Teams desktop client to browser client (Edge) works to start with, but the session crashes in Edge shortly after the call starts. Desktop client thinks it is still in the call until the Edge client is back in. Then it says the call failed and gives you a rejoin link which clearly doesn’t work. Teams to Skype for Business doesn’t work. This is probably because I’m testing between an account with Teams and Skype Online to an account with Teams and Skype for Business Server. More likely it is because Teams to Teams doesn’t work. Type their SIP address into the address bar of a new chat. You’ll get a message saying that “We couldn’t find any matches” and it offers to let you search externally. Once you click on the Search externally message it opens up a chat window. It said that the contact is external and that some Teams features won’t be available. This one says enable external access and add a domain (which isn’t in the admin centre). I’ll update this post when I know more. Go and test. I’d love to hear how you get on.